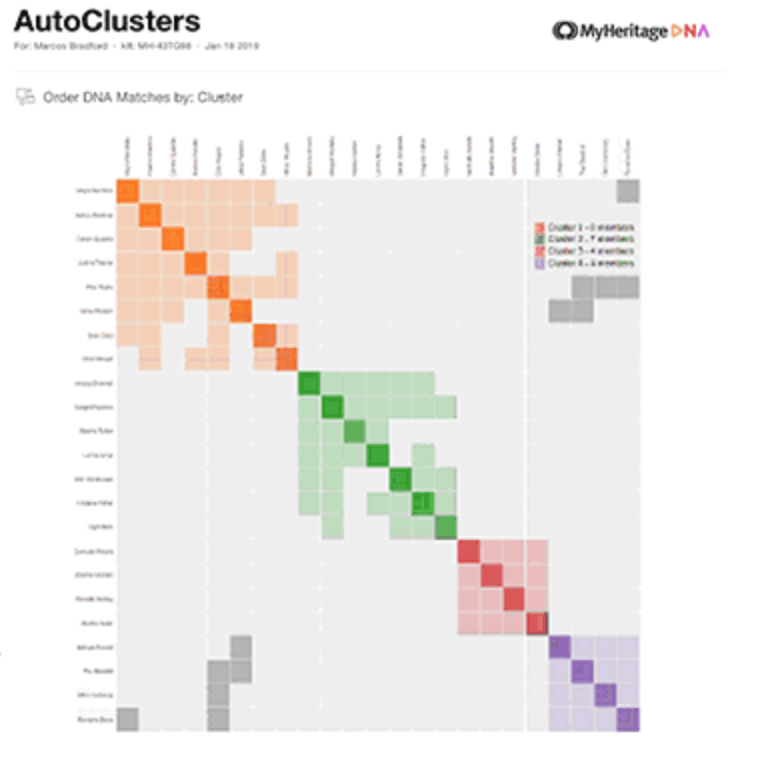 The excitement on Day 1 of RootsTech 2019 was MyHeritage announced that with the help of the team at GeneticAffairs.com, they were releasing a new DNA tool, AutoClusters, to help identify common ancestral lines for DNA matches. This tool should appear under your DNA tools in the next day or so. The way it will work at MyHeritage DNA is the x-axis and y-axis for this grid will display the identical data which will be names of DNA matches as ordered by the computer. My understanding is the site algorithm automatically groups/clusters your DNA matches by those matches who are sharing segments of DNA with you and another person. Everyone in your cluster shares DNA with you and any given DNA match in that cluster shares DNA with another match in your cluster but not necessarily every match in your cluster. The x-axis has DNA match names along the horizontal line or the top of the box. The y-axis has these same names next to the vertical line on the left side of the box. Each shaded square inside the box represents an ordered pair (x, y). So, (x1, y1) is the same person, i.e. (Jane Doe, Jane Doe). (x2, y2) is another person who is the same on both axes, i.e. (Greg Tayler, Greg Tayler), all the way down to (x23, y23), a 23rd unique individual. You treat every box in the grid as an ordered pair of people and the color or lack of color represents if those two DNA matches of yours, share DNA with each other. The reason there’s a darker colored diagonal line of colored squares in the box running from the top left corner to the bottom right corner, is each of those boxes, or ordered pairs, shares all the same DNA because it’s the same person on each axis, i.e. (x1, y1) is (Jane Doe, Jane Doe), (x2, y2) is (Greg Taylor, Greg Tayler) etc. But (x1, y2) is (Jane Doe, Greg Tayler) and the box is a lighter shade of orange meaning they share some (not all) DNA of their with each other and, because they’re on your chart, with you. So person x1 on the horizontal axis shares DNA with you and herself, y1 (dark orange because it’s the same person), and with persons y2, y3, y4, y5, y6, and y7 (along the veritcal axis) but not y8 (on the vertical axis) or y9 thru y22 for that matter. Person y8 is still in that orange cluster because y8 shares DNA with you and persons x2, x4, x5, x7, and x8 (along the horizontal axis). I asked Ran about the darker box in (x1, y23) and he said when a box is shaded darker that way it means person 23 shares DNA with multiple clusters, in this case, orange and purple. One possibility is this person is related to you through multiple family lines. Another possibility is the clusters themselves are related, in this case, the smaller purple cluster could really belong to the orange cluster. Persons y9 through y23 aren’t in the orange cluster because none of them share the necessary threshold of DNA with persons x1 thru x8. But they do share the necessary threshold of DNA with people in either the green (x9 thru x15), red (x16 thru x19), or purple cluster (x20 thru x23). By clustering matches who share some similar DNA with you and other matches, you have a nice picture of a possible relationship. It’s no guarantee, but it’s a great lead. That’s the goal with a DNA match, to find your MRCA or Most Recent Common Ancestor and trace your how you’re related. AutoClusters are awesome because a computer is giving you a visual chart with names of your DNA matches who may be descended from a common ancestral line. So the orange cluster is a group of DNA matches who may descend from a line, the green from another related family line, etc. It’s not a guarantee that you’re all descended from the same person, but it’s a huge hint. And it doesn’t name the ancestors or ancestral line, but you only need to figure out the ancestral line with a few of the people in the cluster and then verify it with the others. And the computer does all the work. (Oh…and the developers at MyHeritage and GeneticAffairs–thanks for the sleepless nights!!!). AutoClusters can simplify your DNA match research. Rather than starting from scratch with each DNA match, you go to the AutoCluster and figure out the common ancestral line for a cluster, then if your DNA matches in that cluster don’t have a family tree, you can build a descendancy tree for a proposed common ancestor and possibly find your genealogical record match to that genetic match. Which, leads me to MyHeritage’s next big announcement today, their Theory of Family Relativity which will use DNA data, Family tree data, and Genealogical Record data to propose possible connections between you and a DNA Match. Seriously?!? What work will be left for genealogists? I’m going to veg in front of the TV watching WALL-E and let MyHeritage break down all my brick walls. Pretty exciting for Day 1 of RootsTech! Stay tuned for more updates.